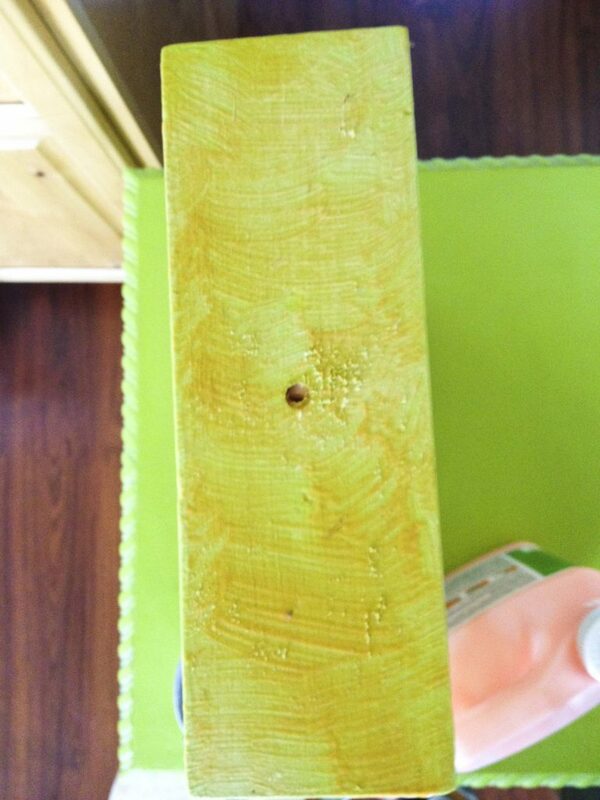 There are varying ways of stripping paint off wood. Or rather, there are varying products. But I have only used one, and that is because it is safe. I wouldn’t mind using Klean Strip and getting in with the chemicals, but I work in close quarters with my kids and I wanted to use something that wouldn’t put out toxic fumes or could possibly cause injury if the kid touched it. I may give Klean Strip a try in the future. But for now, I use Citri Strip and it works well. 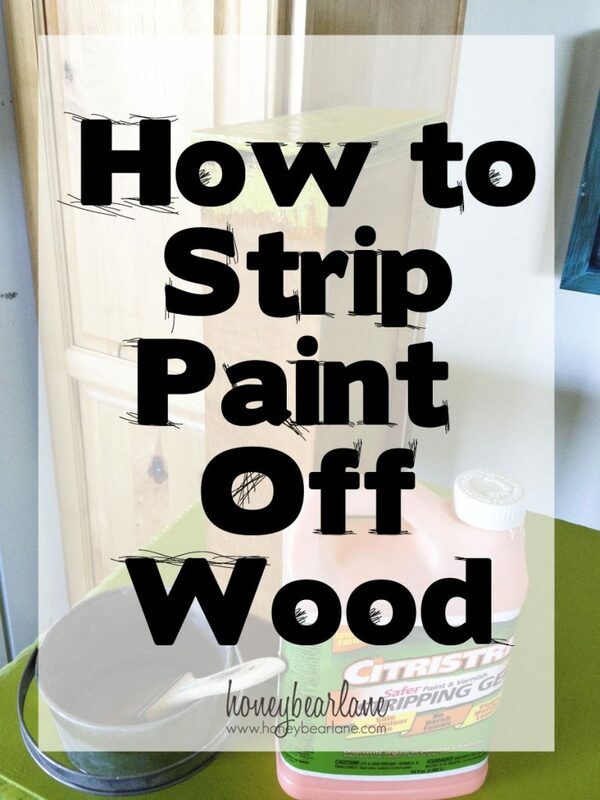 So without further ado, here is how to strip paint off wood. You will need to determine your piece and whether or not it is worth stripping. Make sure it’s solid wood because it’s not worth doing to a laminate piece. I think you could probably strip a wood veneer piece if it’s antique or valuable, but I haven’t tried it. Solid wood is a safe bet though. 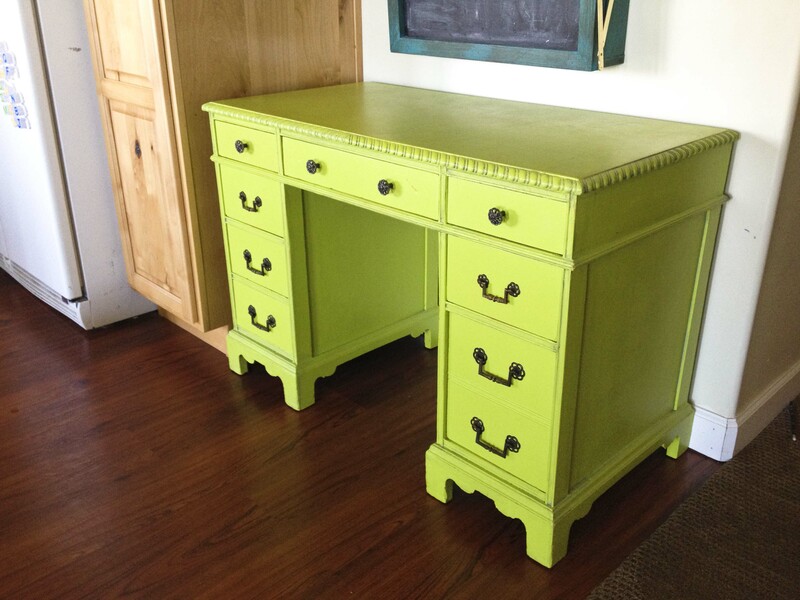 I have this lovely bright green desk, which I painted that color two years ago. Two years ago I went paint crazy and painted everything in sight. I found this awesome old desk at the ReStore and snapped it up. I thought about stripping it then, but it was half covered in old red paint and with all the grooves and detail trim, I didn’t want to bother. And I’m still not going to. I painted it green then but it was not the right shade so it kind of bugged me. Now I’m going to paint the body white and strip the drawers for a two-tone effect. Pour your Citristrip in a metal container. Using a cheap chip brush, paint on a layer on the area you want to strip, nice and thick. If you are stripping a large piece, it might be nice to work in sections. It’s hard to tackle an entire piece at once. This is the little trick I learned which is very helpful. 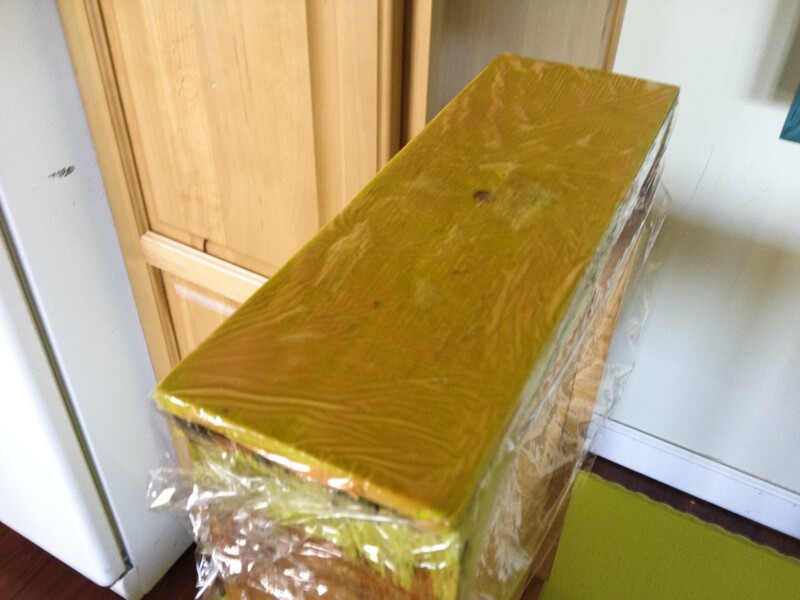 Wrap your Citristrip’ed area in plastic wrap. Nice and tight. Then let it sit for at least an hour, maybe more. You could do all the drawers at once. I didn’t because I am teaching a class this weekend on furniture stripping so I’m going to demonstrate on other drawers. Remove the plastic wrap. Then using your plastic scraper, start scraping the paint. It should come off easily, almost in a sheet. If it’s thin old paint, it might require more scraping and more sanding. Be patient, stripping is not a quick thing. But I like it–it’s like discovering treasure underneath. Your piece will look like this–kinda gross and slimy with particles. But there’s buried treasure under that paint! Now you will use your stripper cleaner to wipe off the stripper. I actually sometime will wash it with soap and water to really get that residue off. 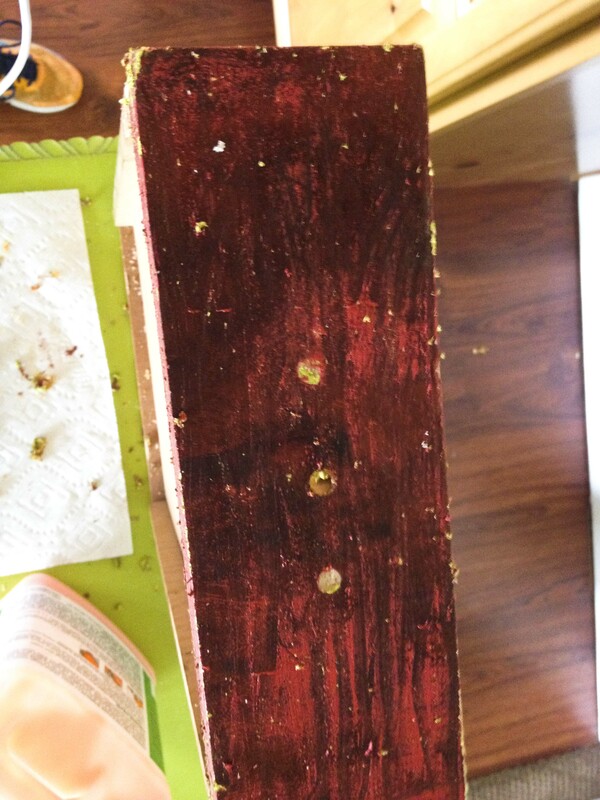 If you try to sand with the residue still on, it will gum up your sandpaper and make it worthless. Let it dry for a little while. Sand the piece with a fine grit sandpaper. 120-220. This is where you get off any residual paint off. Sand in the direction of the grain. If you have paint embedded in the grain, I probably would just leave it. I think it gives the piece character and history. 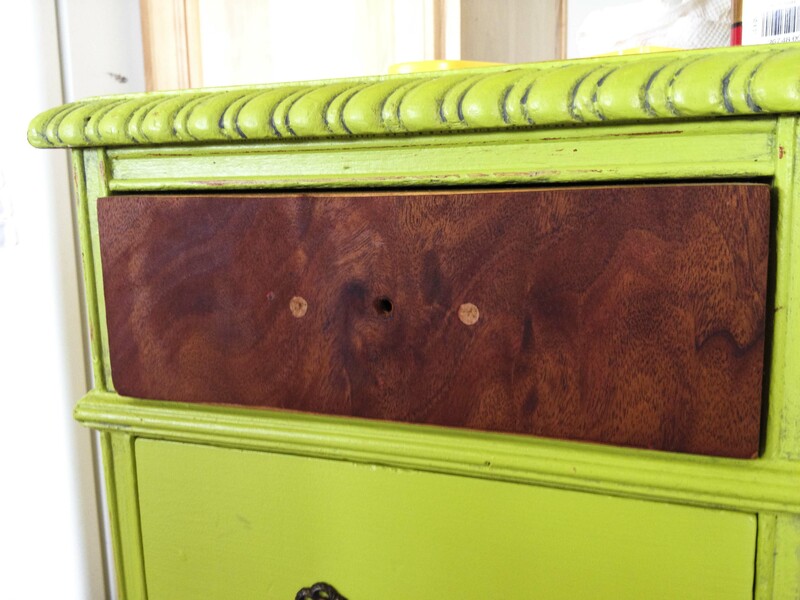 And yes, I AM teaching a class all about furniture stripping AND how to make new wood look like reclaimed old wood. It’s this Friday at 7 pm at the Pinner’s Conference! 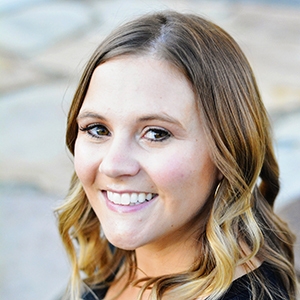 If you live in Utah, definitely check this out! You can also use my code HONEYBEAR LANE to save $5 on your ticket. I would love to see you there! I have used Citristrip before and thought it sucked… BUT I didn’t know about the plastic wrap trick AND I don’t think it put it on thick enough. I’m definitely going to give it another try with your little trick. Thanks for showing us how to do that! I am also pinning to my board “Caring for & Revamping Your Vintage Finds” (http://www.pinterest.com/vintagecottage/caring-for-revamping-your-vintage-finds/). Thanks! I haven’t tried Klean Strip but the stripper remover worked so well I might give the stripper a chance. However I love that Citristrip is very safe and relatively non toxic (fumes.) Good luck! Hi! I am in the process of doing your process. I had forgotten most of the steps but I did the following: I started with our claw foot oak dining room that had a coat of vener, 2 coats of chalk paint, primer, latex paint. 1. I put on the Citristripper with a cheap paint brush, plastic wrapped for 24 hours, took old metal scrappers and it all came right off. I am going to have to use the citri strip on one section because it didn’t quite get all the paint off. Instead it gummed it around. Then I will follow your above steps. Thanks so much for this tutorial! I can’t wait for the finished product!